'One of the most positive experiences of my life. The exhilaration and enjoyment from performing for the first time were exceptional.' Participant. 'Brilliant working as part of a team with a common goal. Citizens staff were inspirational.' Participant. 'Was different brought good confidence and energy to the class. Staff were supportive. All in the project was successful. Get to put a message across in acting. Good group very constructive and live.' Participant. Creative Scotland's Arts and Criminal Justice Fund funded and supported a year-round programme of creative work over a three-year period in HMP Barlinnie. The Citizens Theatre delivered a number of projects and workshop programmes over three years including classes in acting, creative writing, design and scenic painting, playwriting, music and performance. The prison hosted its first Barlinnie Arts Festival - a week-long multi-artform programme which showcased and celebrated creative work produced by prisoners throughout the establishment. Martin was invited to work with 19 men on playwriting techniques for performance. Together the group looked at aspects of masculinity and were inspired by Shakespeare's Seven Ages of Man. The group created their own scenes based on growing up as a male in Scotland and the various ways that life is shaped by decisions made during significant periods. 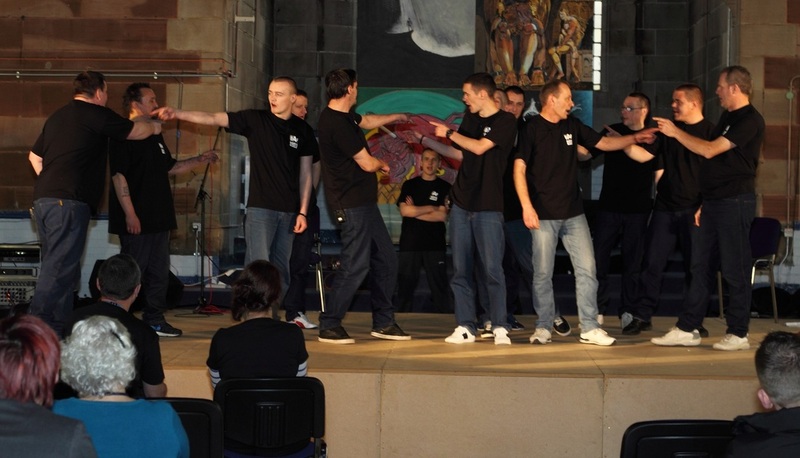 The resulting performance Man Up was staged in HMP Barlinnie Chapel in front of prisoners, invited guests, SPS staff and Scottish Prison Arts Network delegates.